You tend to forget almost 50 – 80% of what you learn if you don’t revisit it within 24 hours of learning. Highlighting anything makes it visually distinctive and we generally tend to remember anything distinct. Don’t try to impose everything on your learners in one go. Present small bites of information to your learners at regular intervals to help them retain the same. Draw mind maps that will make the connections visible and will help you associate better. To master a topic, curate information about it, write about it, share it with others or give your opinion. Just keep the conversations going and you will see how it does wonders to your knowledge. HTML5 allows instructional designers to create and design eLearning for mobile devices. Since the content should be tested on multiple devices and browsers, an evident drawback of this approach is that it creates multiple versions of content that IDs need to manage. Create a small trial group of end-users in the beginning of an eLearning project. Find out what they need/want. If we can get their buy in, they become advocates for eLearning. Get your users to do something interactive. If they are just reading a slide and clicking ‘Next’, they might as well read a book. If you can show it with a picture, do so. Wherever possible, make presentations graphical. You can use pictures, charts, and SmartArt. Add user acceptance testing to the QA review process of your eLearning. It provides a “fresh set of eyes” from the learners. Now is the best of times to be an eLearning specialist. Arcs form a part of many processes and activities we choose to engage in each day. An interactive learning arc can be used as a short learning nugget that is complete in itself or as part of a larger course. Advanced arcing looks within interactions and builds internal links from one interaction to another. I hope you had a good time reading all these useful nuggets of information. To access all our webinar recordings, click here. Do share your thoughts with us on this post. 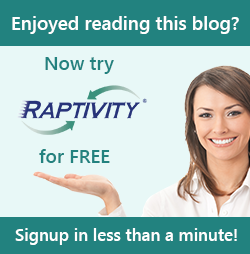 For any queries, write to us at info@raptivity.com.